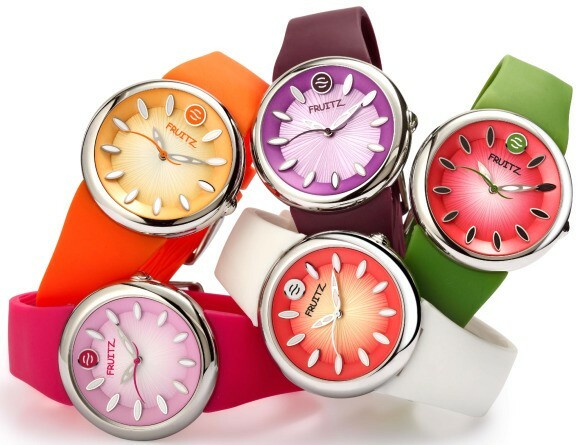 Not only are these new Fruitz watches fun, they are good for you. Natural frequency technology, is used in each Fruitz watch. The concept behind natural frequency technology is that it enters your body’s biofield re: your “master energy field”, the one that regulates all your bodily functions and sends messages to your body to relax, take a deep breath, etc. By doing this, your stress levels decrease, something which we all have too much of. There have been countless studies done and celebrity endorsements that say it’s true. The idea of using different fruits as inspiration for different watch styles is super creative. The watch dials represent a piece of fruit cut in half, with a sunburst pattern and three dimension face with a curved chapter ring; hour markers look like seeds. The cases come in polished steel (or gold plated) and the straps are rubber and available in a wide, bright array of colors. The best news of all is that Fruitz watches sells for a very reasonable $225, available at fruitzwatches.com truly making it a watch that each member of the family can have and love wearing. Which kind of fruit are you? I absolutely adore studying your weblog posts, the variety of writing is smashing.This webpage as usual was educational, I have experienced to bookmark your website and subscribe for your feed in ifeed. Your theme looks lovely.